Which One Of "The Mane Six" Are You? 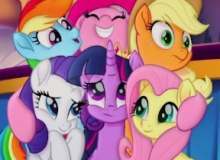 This is just a very short quiz you can take to see which of the "Mane Six" mains, from"My Little Pony" you are. While you're reading I'd like to take a moment of you're time to say "LOL, you just wasted like 2 seconds of your life reading this." Thank you for actually noticing me, and going on this quiz everybody reading this, and yes, you too Paul. I'd like to take this moment to honor my cat whom I haven't seen in years, and who is probably eating tuna as I am speaking right now, #RUDE. You have five minutes to spend, doing whatever you want, what do you do in that time? Shop, or look at clothes. Work, or do something benefiting. Make jokes, and decide to go prank people. A new pony just moved into Ponyville, how do you greet her? Go straight to her house, and give her a bubbly, over-the-top greeting. Wait for her to settle in, then go greet her. Feel timid about meeting her then build up the courage to make it to her doorstep, and ring the doorbell. Make a few snacks, like apple pie, or tarts, and give them to her when you meet her. Ask her if she likes the same things you do, and suggest a race later. Make her some new clothes, and bring them over to her. What "Element of Harmony" do you think describes you the most? Which one of these books would you consider reading? 20 Fashion Designs You Wish You Thought Of. Random Question #1: If you became a ghost who would you haunt? The person who you hated the most. Random Question #2: If you could be in one cartoon universe what would it be? Random Question #3: If you had an Eevee, what would you envolve it into? Random Question #4:What pixel game have you heard of? Random Question #5: Is water wet? Random Question #6: Do you find death sad? Random Question #7: Which anime have you heard of? Quiz topic: Which One Of "The Mane Six" am I?